The Sega Mouse (セガマウス) is a special computer mouse designed to work with the Mega Drive and Mega-CD. It can be seen as the Sega alternative to Nintendo's mouse accessory, designed primarily for Mario Paint for the Super NES. Only a few games were designed with Sega Mouse functionality in mind. The Sega Mouse was released in Japan and Europe, only the major difference being the colour scheme - Japan opted for blue buttons, Europe for red. Both came packaged with a blue Sega-branded mouse mat. The European packaging actually calls it a Sega Mega Drive Mouse, although games still refer to it as the "Sega Mouse". The Sega Mouse is a ball mouse, meaning it needs to be cleaned after regular use in order for it to continue to function properly. Despite there being three buttons on a standard control pad, there are only two buttons on a Sega Mouse, and , however unusually the unit places its button on the ball itself - flipping the peripheral turns it into a clickable trackball device. North America did not receive the Sega Mouse, but instead the Mega Mouse, a similar but larger unit which added the missing button and scrapped the clickable trackball. 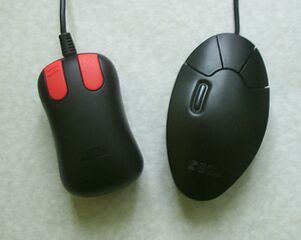 The Mega Mouse was distributed with a red/black mouse mat, and its awkwardly placed button comes at a disadvantage to left-handed users. Supposedly there are also some compatibility issues between the two mice, but this needs to be investigated. Few games were created to take advantage of the Sega/Mega Mouse, and contrary to popular belief, Art Alive! (seen as the direct rival to Mario Paint) did not have mouse support. There were no Sega 32X games with mouse support. Main article: Sega Mouse/Magazine articles.